Sterling Children's Books, 9781454915508, 40pp. 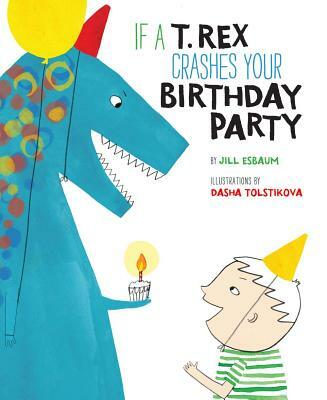 You never know what will happen when a T. Rex crashes your birthday party. Sure, you'll be super excited when he turns up at your door. But then he'll stomp. He'll ROAR. He'll look at you as if he's wondering how you taste with a little mustard. In the end, though, you just may find yourself asking him to come back next year This delightfully whimsical picture book has a fun twist kids will love. Jill Esbaum is the award-winning author of many picture books, including I Am Cow, Hear Me Moo! and I Hatched! (both Penguin). She also enjoys writing a variety of nonfiction books for National Geographic Kids, including the popular Angry Birds Playground series. Jill lives on a farm in IA. Learn more at jillesbaum.com and picturebookbuilders.com. Dasha Tolstikova is an illustrator whose work has appeared in The New York Times, Wall Street Journal, and New Yorker. Her picture book The Jacket (Enchanted Lion Books), written by Kirsten Hall, was named a New York Times Notable Book of 2014. She wrote and illustrated the graphic novel A Year Without Mom (Groundwood Books). She lives in Brooklyn, NY. Learn more about Dasha at dashatolstikova.com.